1. Pare the zest from the lemon and squeeze the juice. Place in a medium saucepan with the vanilla pod, sugar and 1 litre of water then bring to a gentle simmer. 2. Peel the pears, removing a slice from the bottom so they can stand upright. Add the pears to the pan and simmer for 20 minutes then turn off the heat, leave to cool completely then chill until you are ready to serve. 3. When ready, place the raspberries on 4 small serving plates and mash with a fork until pulpy. Press 2 blueberries into each pear for the eyes then sit the pears on the raspberry pulp. Spoon over a little of the cooking syrup and serve. 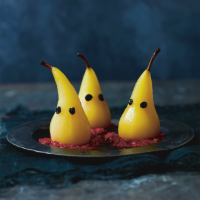 Make sure the pears are completely submerged in the liquid so they poach evenly – add a little more water as needed.